1. 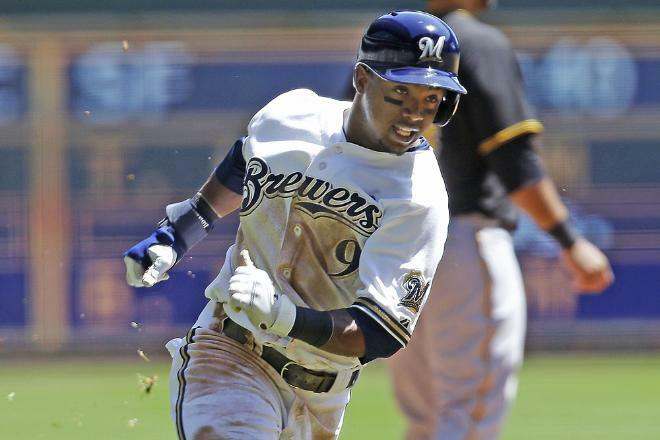 Jean Segura-SS-Brewers- 93% owned- This 23 year old, now in his second year in the majors, played in an unimpressive 46 games last season, his first in the bigs. He had no home runs and 14 RBIs in 151 at bats while batting a pedestrian .264. You can see why not many touted Segura as a potential ‘sleeper’ candidate before the season began. His numbers so far, which are superb, are also helping fantasy owners get a leg up on some of their competition. In Yahoo! Leagues, for example, Segura is the 2nd highest ranked shortstop in all of baseball, trailing only All-Star Troy Tulowitzki. The undrafted Dominican is on pace to hit 22 home runs, score 92 runs, knock in 68, and steal about 42 bases. Segura is someone that those in keeper leagues have already grabbed, and with good reason; he plays at one of the weakest fantasy positions in baseball. 2. Jedd Gyorko-2B,3B-Padres-64% owned- A second round pick of the San Diego Padres out of West Virginia in the 2010 draft, Gyorko not only has a terrific start to the season under his belt, but has been on fire over the past couple of weeks. Gyorko has hit safely in 13 of his last 14 games with 3 homers and 9 RBIs. His keeper status is also helped by the 24 year olds multi-positional status. How is he faring thus far in fantasy leagues? Currently he is ranked 12th in Yahoo! Leagues among 3B and 10th among 2B. In both cases, Gyorko is just one place behind one of our sleeper picks, Kyle Seager. Gyorko is also third in hitting (.284) among National League rookies with 100+ at bats. He is second in home runs (8) and RBI (25). 3. 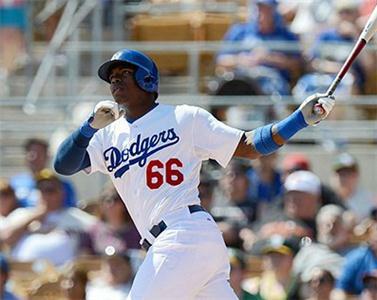 Yasiel Puig-OF-Dodgers-83% owned- Puig, pronounced like ‘intrigue’, was just called up by the Dodgers a week ago and has only a small sampling to show, but as we tweeted back on June 2nd, Puig “should be on all fantasy owner’s radar.” We knew he was exceptional when we watched him in Spring Training as he posted a .517 batting average. With nowhere on the club to put him, he began the season in Double-A Chattanooga until Andre Ethier went on the DL and the Dodgers found themselves in last place in the N.L. West. The Cuban defector had signed a seven-year $42 million contract with L.A. in 2012 and it was just a matter of time before he would be called up. Some are saying that his promotion could save manager Don Mattingly’s job with the Dodgers as last place is the ‘last place’ that the team’s owners expect their club to be in. As a Yankees fan, it’s in my DNA to abhor the Dodgers. But man if I don’t root for Mattingly to stay on and Kemp to get healthy and hot. And what’s worse? I’m all ready to pen a new screenplay entitled “Life of Puig”. I love this guy Cayman! Been touting him on twitter and added him to this piece. He’s a keeper for the ages who reminds me a bit of Roberto Clemente. Has an arm in the OF and even though he’s 6′ 3″ 215 lbs, he can run & hit. I too am always rooting doe Donnie Baseball…how can a true Yankees fan not?! ?